The outdoor studio season is in full swing! You can take Jasyoga Video anywhere, but sometimes it's nice to completely unplug. Last year we created The Sunbather, a flow that's easy to hit anywhere (hello beach towel). This summer, we've created two new outdoor studio routines for you, Fluidity (below) and Strength (coming next week). Tip: Scroll to the bottom for easy to Pin/save chart of all poses. And if you love this short routine, check out Full Body Mobility in Work IN or Jasyoga Video. Enjoy! And big thank you to Athlete for Yoga Andie Cozzarelli for leading us on this routine. Round your spine and take your chin toward your chest, dropping your head. Lift your hips, chest, and chin and drop your abdomen toward the floor. Step your feet wider than hip width apart, externally rotating your thighs in your hip joints so that your legs turn away from the center of your body (your hells point in and toes point out. 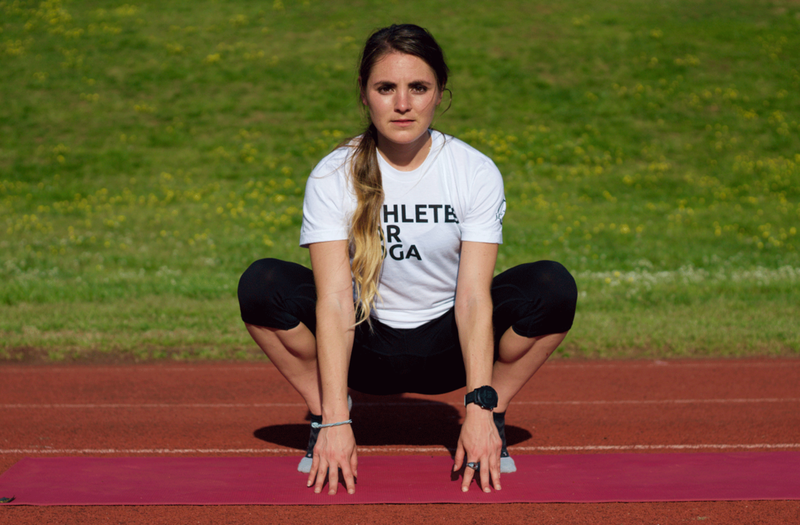 Bend your knees deeply to come down into a squat, resting your hands on the floor between your legs. Stay up higher, resting your hands on a prop for support if your knees are uncomfortable in a deep squat. Lift your heels as high as you can. Drop your heels toward the floor. Kneel with your legs hip-width apart, keeping your shins parallel. Lengthen your torso down onto your thighs. Reach your arms forward, palms down, or rest them back along your sides, palms up. Rest your forehead on the floor or a block. Stay for at least one minute. >> If your neck is uncomfortable, place a block underneath your forehead to help neutralize it. Time for the #JASYOGAJULY Streak!